1 Karte : Kupferdruck ; 53 x 82 cm Bellin s.n. 1 Blatt : 52 x 68 cm s.n. 1 Blatt : 52 x 69 cm s.n. This coastal plan is drawn to a scale of 3 inches to the mile, unlike most inland drawings, which are two inches to the mile. The larger scale reflects greater concern for the vulnerability of this area. The Solent gives access to the ports of Portsmouth and Southampton, making it a particularly attractive avenue for naval invasion. Hurst Castle is marked in black and red at the narrow entrance to the Solent. Built by Henry VIII as part of a defensive chain of fortresses, it is sited where the ebb and flow of the tides create particularly strong currents, providing an excellent natural defence against would-be invaders. The castle was modernised during the Napoleonic Wars. To the right of the castle, salt marshes extend towards Lymington. The saltworks, shown by blue squares, once supplied most of the west of England. A signal house is noted on Christchurch Head. This drawing covers a section of the south coast bordering the Solent and Southampton Water. The defence requirements of this area were considerable as the Solent gave access to the important ports of Portsmouth and Southampton. Calshot Castle, shown here in red and black at the mouth of Southampton Water, was built by Henry VIII as part of a defensive chain defending the coast by cannon power. 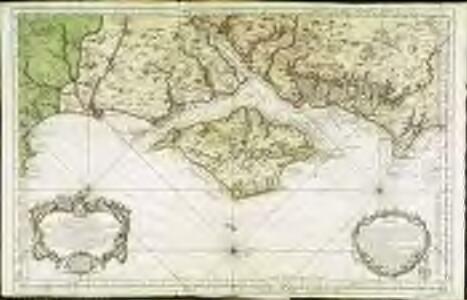 The drawing features a large decorative compass whose rays are visible extending to the edge of the land mass. Several corrections can be seen in black ink, where place names and the exact course of roads have been altered.